Hi everyone, and welcome to the very first edition of the Language Creation Tribune! Jessie Sams and the other editors have worked very hard to make this crazy idea of mine a reality, so please join me in a round of applause for them! The idea behind this new quarterly newsletter is to give our members (and whoever else is willing to read this) a digest of what’s been happening in the conlanging world in the previous three months. The conlanging community is a vibrant one, and much is happening around language creation these days, that it can be difficult to follow, even if you’re on Twitter, and Facebook, and Google+, and Tumblr, and all those other forums and mailing lists that form our community. The LCS members themselves also have things happening that they’d like to share to other members and the world, and this newsletter is a way to allow this to happen. We at the LCS also want to give LCS members more exposure to their conlanging works, and this is where John Quijada’s Conlang Curiosities rubric comes in. Finally, we of the LCS Committee and Board of Directors work hard at bringing LCS members new and improved perks, and part of the goal of the Tribune is to remind you of the things your membership gives you access to, and to announce new benefits as they become available. As with everything we do, the Language Creation Tribune is meant for you, our members. So your feedback is more than welcome. Did we miss a vital piece of news, or do you have an idea for a useful rubric? Then don’t hesitate to mention it to us. We want this newsletter to be the best you could ever wish for! Before I leave you to read the rest of this newsletter, I’d like you to have a quick look at the future. 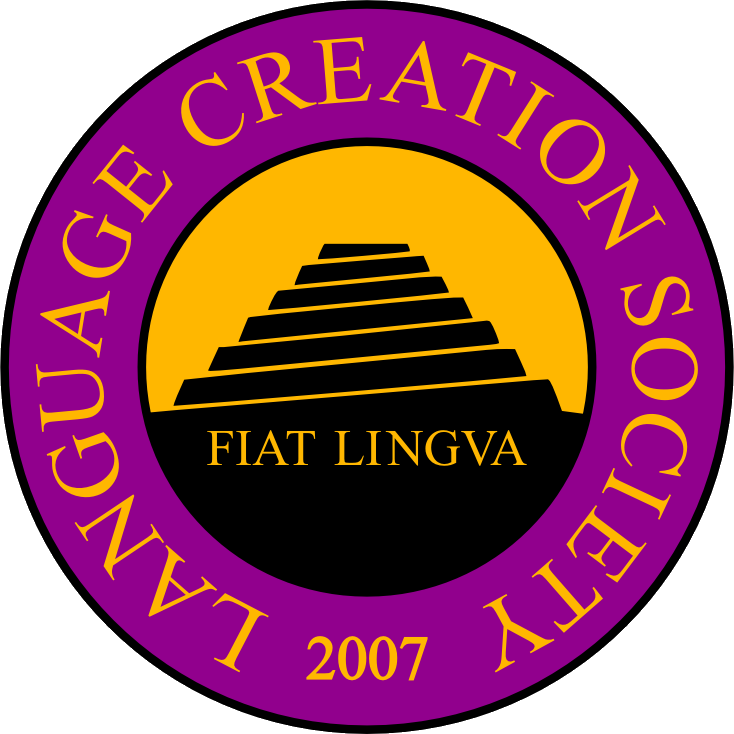 As you know, the Language Creation Conference is a biennial event, and the next one is scheduled to happen next year. But if we want it to be a success we need to start thinking about it now. I have already sent a call for proposals, but you may have missed it. So if you’re interested in hosting the next LCC, please make yourself known (if you haven’t done so yet) by sending an email to lcs@nullconlang.org. We will send you further instructions on how to set up a proposal then. Be quick, the deadline is August 31! So, without further ado, I’ll let you enjoy the rest of the Language Creation Tribune. Fiat Lingua! Welcome to the Conlang Curiosities column, which will feature interesting observations, tidbits and musings regarding various conlangs. In this premiere column we feature the Antapa language created by LCS member Dr. Jan Havliš. Antapa also declines its nouns for case, shown via a consonantal infix between the second and third vocalic radical. There are eleven cases, a few of which are a bit unusual: agentive (case of the active subject or naming case), facitive (case of the passive subject), causative (case of the direct object), addressive (case of the indirect object or directing case), partitive, attributive, possessive, mediative, agitative (case of movement), locative and temporal. The enumeration system is vigesimal (base-20). Another interesting feature of the language is the way that affixes conveying certain verbal modalities can be expressed only in conjunction with specific tense markers. For example, the expression of wishes, demands, exhortations, and beliefs each have their own specific affix which can only be used with the infix for future tense. The evidential hearsay affix can only be used with the past tense, and an affix indicating something Jan calls “supertemporal actions” (I assume that means a timeless/gnomic sort of tense) can only be used with the present tense infix. It is morphological constraints such as these that are the kinds of subtleties I enjoy when examining artlangs and go a long way to giving a conlang its character. You can check out all of Jan’s conlangs and read much more about his eclectic and academic activities by visiting his uniquely minimalist homepage. Congratulations to George Corley on his recent engagement to Li Wang! They are planning to get married on July 26th. The LCS worked with Ari Handel and Darren Aronofsky to find a conlanger to create an angel language for Noah, which recently debuted. Bill Welden created the language. Ultimately, they decided not to use any language material in the movie (they decided to move in a different artistic direction), but they were very happy with Bill’s work. D.R. Merrill recently finished the manuscript for his science-fiction novel Lamikorda, which features the full-blown conlang Kiitra (plus sketchlangs Baija, Konarai, Krishkarha, Saakh, and Alplai Sign Language). You can find more information about Kiitra and other Alplai languages here. He is currently searching for a publisher and wants to assemble a “street team” to get word out about his novel via word-of-mouth, social media, and other venues. He is happy to send out copies of the manuscript to people who would like to volunteer to help him; you can contact him at hirajnashaijaat@nullconlang.org if you are interested. Sai appeared (remotely) before the Federal Election Commission on April 23 to discuss bitcoins; while the vote from the FEC has not yet been publicized, you can find more information on Sai’s appearance and bitcoins in general at the Make Your Laws website. 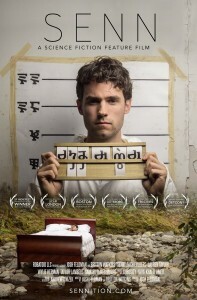 Britton Watkins and his husband, Josh Feldman, are pleased that their first feature film, Senn, has been selected by 6 different film festivals in the US and Europe. The most recent festival was Sci-Fi London (29 April) and the next festival coming up is The Gothenburg Independent Film Festival (22~25 May). Senn contains an original conlang that is featured prominently in its written form in the production design and used for the lyrics of two of the soundtrack’s songs. Britton and Josh are currently in the UK and will be traveling to Sweden for these screenings and participating in Q&A sessions after each. More information and the film’s trailer can be found here. Thanks to the LCS Jobs Board, Britton is currently working on developing a working grammar and lexicon for the fictional language, Aklo, which was originally imagined and named by Arthur Machen 1899. It has since been referenced often in the Cthulhu Mythos that originated from the work of H.P. Lovecraft. This language will be featured in the 2014 web series, Whispers from the Shadows, produced by Marx Pyle in collaboration with The Lovecraft eZine. To follow and support the production, please visit its Facebook page and look for the Kickstarter campaign as well. David Peterson, creator of Dothraki, visited the University of Colorado Boulder on April 21 to talk about conlanging. There was an Esperanto Performing Arts and Film Festival from April 11-20 on Whidbey Island near Seattle, where there were Esperanto language classes and filmmaking classes taught in Esperanto. Morley College is now offering an Elvish language course which will teach students the syntax, phonology, and vocabulary of Common Eldarin and Sindarin. Conlanging is a real profession and is becoming more well known because of shows like Game of Thrones. David Peterson and Paul Frommer discuss how they created their languages and the future “stay-power” of the languages is looked at; you can read articles about these interviews in the Boston Globe and Deep Media Online. On January 18th, 2014, the word ‘conlang’ was officially added to the website Online Etymological Dictionary. Aequinox, a compendium of constructed language literature, is an online publication started by Inara Tabir and Andy Ayres of the Facebook group “Conlangs.” All current and future issues can be found here. Neil Whalley’s website is a portal for discovering Celtic and Cumbraek, including in-depth information on grammar and history. For those on Reddit but not Facebook, Google+, etc., the /r/conlangs subreddit is an active discussion board full of translation challenges and conversations about conlangs and conlanging. You do not need to have an account on Reddit to view these posts. Matthew DeBlock’s Dscript website “turn[s] alphabetical language into glyphs.” Dscript allows the conversion of primarily English texts, numbers, and chemical models. It is designed to be intuitive and versatile. The LCS Lending Library will be closed from July 25, 2014 through August 25, 2014. The Librarian will be on vacation. Hey I am a young student from UK. I love to learn more languages. I can speak English and a bit of Mandarin at the moment, but want to learn more and more. I was also thinking if I could create my own language. I started about 10 or 20 languages, but I just couldn’t keep on with it. I just start making the alphabets and I stop there, because I don’t know how to keep on with it anyway, so I need a help please. Hello everyone! 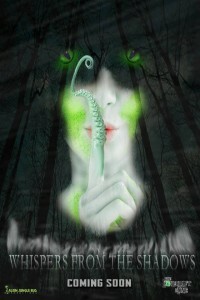 The Whispers from the Shadows team just wanted to share the link to our Kickstarter with you. Please check it out and consider supporting it, either with contributions or just sharing it with friends. I was delighted to see this inaugural edition. Did Sai’s appearance before the FEC have any relevance to the art of conlanging? I must admit I can’t work out what possible relevance it could have!